In theory, the federal government sets minimum guidelines for each state's unemployment insurance system, and then each state sets its own rules for what is paid in and and what benefits are offered. Each state has its own unemployment trust fund. The idea is that the the trust fund will build up in good economic times, and then be drawn down in recessions. But it hasn't actually worked that way for a long time, and the problem is getting worse. 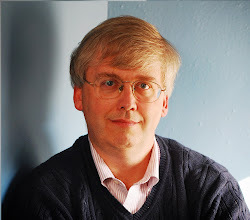 Christopher J. O’Leary lays out the issue and possible solutions in "A Changing Federal-State Balance in Unemployment Insurance?" written for the January 2013 Employment Research Newsletter published by the Upjohn Institute. When a recession hits, the federal government has developed a habit of stepping in with extra unemployment insurance funds. For example, the feds stepped in with additional funding for extending unemployment benefits in 1958, 1961, 1971, 1974, 1982, 1991 and 2002--as well as during the most recent recession. With the feds stepping up, it has been easier and easier for the states to keep their unemployment taxes as low as possible. For example, average unemployment insurance taxes (adjusted for inflation) were $274/employee in 2008, lower than the $350/employee in 1994 and the $515/employee in 1984, according to Ronald Wilus of the U.S. Department of Labor. 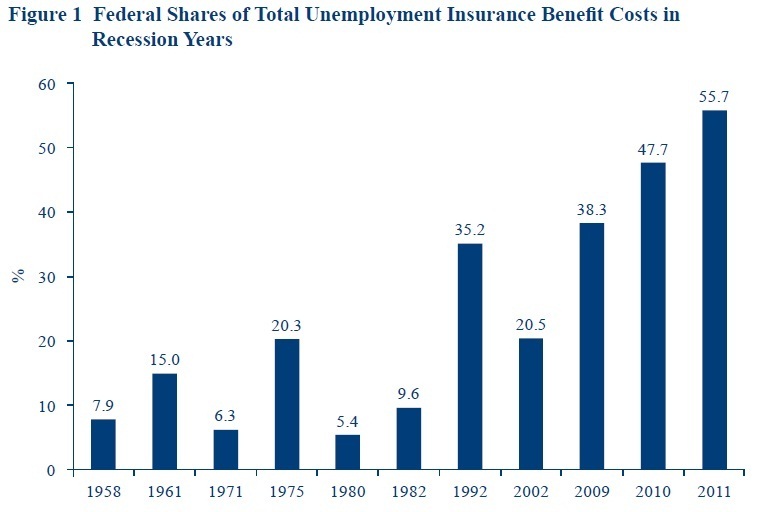 As a result, over time the feds are paying for a larger share of unemployment insurance during recessions. Here's an illustrative figure from O'Leary. For some perspective on the revenues coming into the unemployment trust funds from the regular unemployment tax, as opposed to how much money is going out, here's a table from a Congressional Research Service report on "Unemployment Insurance: Programs and Benefits," by Julie M. Whittaker and Katelin P. Isaacs, dated December 31, 2012. Notice that when unemployment rates were fairly low from 2005-2007, revenue exceeded outlays by about $10 billion per year. Then from 2009, 2010, and 2010, outlays exceeded revenue by something like $100 billion per year. The difference was made up by general taxpayer spending. The intergovernmental incentives in the unemployment insurance system are clearly messed up. States have an incentive to keep unemployment insurance premiums fairly low, promise significant benefits, and then let the federal government pick up the tab when a recession occurs. What would be needed to get back to a system where states save up funds for unemployment insurance money in trust funds--even if some federal help might occasionally be needed? One step suggested by O'Leary is to raise the "tax base." At present, the minimum federal standard requires that states collect unemployment insurance taxes on the first $7000 of taxable wages--a level that was established back in 1983. Just adjusting that $7,000 base for inflation would mean increasing it to about $16,000. O'Leary notes that 35 states currently have a taxable wage base at or below $15,000. A second step would be to have a rule that unemployment insurance benefits would not kick in until after a waiting period. O'Leary writes: "A much neglected potential reform on the benefit side would be to institute waiting periods of 2–4 weeks, with the duration of the wait depending inversely on the aggregate level of unemployment. ... A somewhat longer waiting period will reduce program entry by those with ready reemployment options, and help to preserve the income security strength of the system for those who are involuntarily jobless for 4, 5, or 6 months." Yet another step would be to use federal rules to discourage states from lowballing the funding of their unemployment insurance and relying on an influx of federal funding. Here's O'Leary: "[T]he federal partner should institute minimum standards on weekly benefit levels and durations, and also tie potential durations of any future federal emergency benefits to the existing state maximum durations. For example, a state providing up to 26 weeks would get 13 weeks of federal temporary benefits, but if the state maximum were 20 weeks the federal supplement would be 10 weeks." It's worth pointing out that unemployment insurance has a number of problems other than whether it is pre-funded. You need to meet certain qualification tests for unemployment insurance, typically based on earnings in the previous year or so, and as a result, many of the unemployed do not receive unemployment insurance. In January 2013, about 3.5 million people were receiving unemployment insurance benefits, but about 12.3 million people were unemployed. There are also a number of proposals that seek to adjust the incentives so that unemployment insurance can better co-exist with incentives to find a new job. Some proposals are that unemployment benefits should be larger, so as to soften the economic blow of unemployment, but for a shorter time, to hasten the incentive to find a new job. Some proposals would require or allow people to set up individual unemployment accounts, which they could keep at retirement, so that people would tap their own money before turning to the government fund. One proposal would offer a bonus to those receiving unemployment insurance if they found a job quickly, because it could be less costly for the unemployment insurance trust fund if they find a job faster rather than linger on receiving benefits. 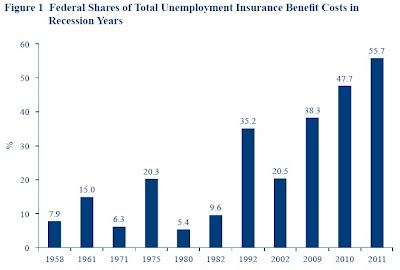 The Great Recession and its aftermath have wrecked the premises of the existing unemployment insurance system. It's time to rebuild.